Butterfly Project: Participate: Buy a Butterfly! Commemorate a loved one or friend. Celebrate nature. Support the Calusa Nature Center! Become a part of the permanent public art exhibit, The Butterfly Project, by purchasing a butterfly that will be installed on the wall of the Calusa Nature Center. Commemorative butterflies will be available for placement under the museum adjacent to the Butterfly Aviary and Native Plant Nursery. Custom made commemorative butterflies are priced at $100. 50% of the proceeds, a total of $50, is donated to the Calusa Nature Center. *Florida residents must pay 6% sales tax. Commemorate a loved one by purchasing a mosaic butterfly! I will design a 4-5 inch butterfly that will be created in glass mosaic and added to the art installation at the Calusa Nature Center. Your butterfly will become a permanent part of the public art exhibit! You are welcome to submit a simple sketch of your butterfly. Here are some examples that are already part of the mural. Even kids can get in on the fun. Ask me how. Your purchase will include your very own donor page on this blog. Your page will feature your name, a photo of you or your family (optional) and links to your business (if applicable). See a sample donor page. A short word or name can be included in the butterfly design. I will create this using small alphabet beads. See example. The following template serves as an example only. Actual butterfly will vary! Email me if you have any questions about the Buy-a-Butterfly Program or would like to arrange another method of payment other than Pay Pal. Please click "Buy Now" to order via Pay Pal. This method of payment is safe and you do not have to have a Pay Pal account to pay this way. All major credit cards are accepted. 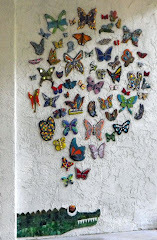 I will then contact you to discuss your custom made butterfly for the Calusa Nature Center wall! Please contact me with any questions you may have about ordering your custom butterfly. I am here to help!